How do choice lists work? Select Setup then Choice List from the menu. Then at the top right of your screen select New Choice List to create new one. Drag and drop the choices into the canvas area on the right side (it works like the App Designer). You can also select a choice list previously created to make changes. In the following example, we want to create a reusable list of options containing a list of facility features that were damaged during a storm or disaster (Foundation, Roof, Windows, Doors, Walls). Once I’ve created this list, we’ll see next how to include this choice field in an app. The Choice List essentially serves as a “template” for a choice field, so you don’t have to manually specify the options each time you build a new app. On the left is the Label (what the user sees in the app) and on the right is the Value (the value stored in the resulting data and contained in the export). 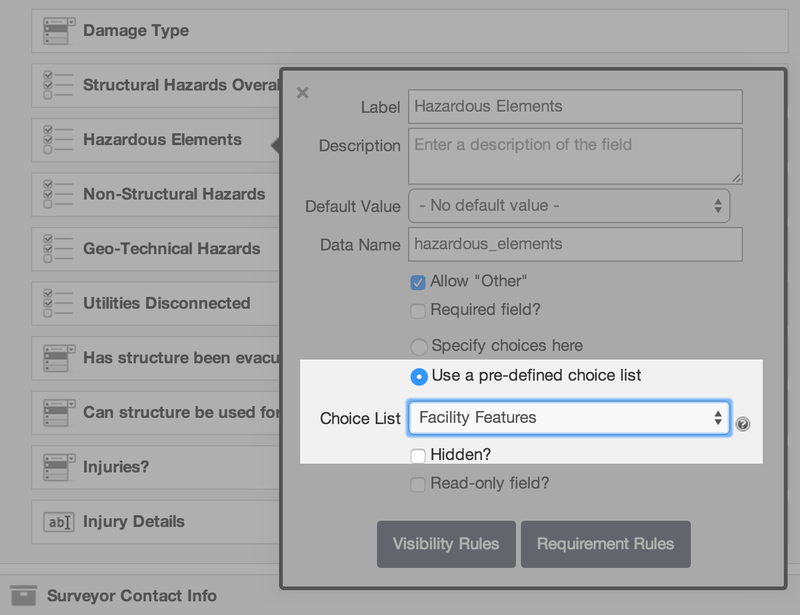 Once a choice list is built, you’ll need to add a new choice field to your app which can reference it – both single- and multi-choice field types can use a Choice List. See here for how to import choice lists.